Although Canterbury’s settlers were mainly Anglican, other denominations have a long history there. Catholics had a small wooden chapel in Barbadoes Street by 1860, later replaced by the Cathedral of the Blessed Sacrament. Designed by F. W. Petre and built of concrete, brick and stone, it was completed in 1905. When in 1934 the visiting English playwright George Bernard Shaw talked about ‘the splendid cathedral’, his hosts assumed he meant the Anglican one in Cathedral Square. He replied that he was referring to ‘the one down by the gasworks’. 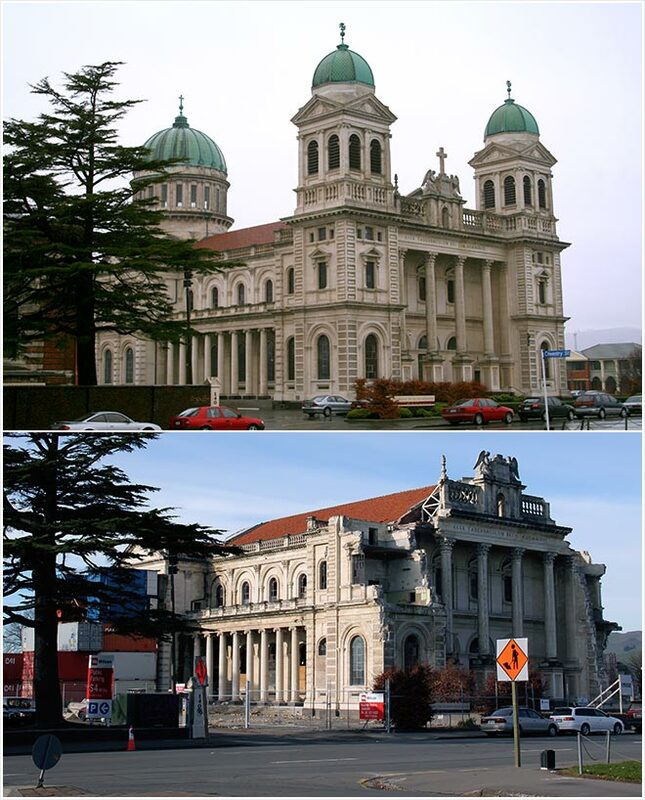 The cathedral was severely damaged in the 22 February 2011 earthquake and, as the image below shows, in 2014 it was still awaiting restoration.